La Rinconada is a town in the Peruvian Andes near a gold mine. 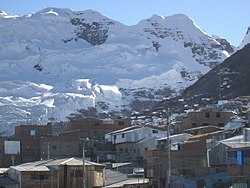 At 5,100 m (16,700 ft; 3.2 mi) above sea level, it is the highest permanent settlement in the world. Between 2001 and 2009, the population increased to 30,000 people from just a small gold prospector camp because the price of gold rose 235% over that period. 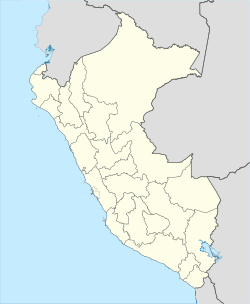 The town is in the Ananea District, San Antonio de Putina Province. It lies at a height of 5,100 m (16,700 ft; 3.2 mi) above sea level. It sits at the foot of La Bella Durmiente (The Sleeping Beauty) glacier. Some successful miners in La Rinconada have homes in Juliaca, which has municipal services and is only 3,825 m (12,549 ft; 2.377 mi) above sea level. The economy is mainly based on the production of gold from nearby gold mines, many artisanal. Many miners work at the gold mine owned by Corporación Ananea. Under the cachorreo[clarification needed] system they work for 30 days without payment. On the 31st day they are allowed to take with them as much ore as they can carry on their shoulders. Whether the ore contains any gold or not is a matter of luck. Pocketing of nuggets or promising chunks of rich ore is tolerated. Women are banned from the mines, but pallaqueras[clarification needed] can be seen working though rock on the mine dumps. Inca Manco Cápac International Airport is the nearest commercial airport; it is in Juliaca. The town lacks plumbing and sanitation systems. There is also significant contamination by mercury, due to the mining practices. Local miners refine the ore by grinding and treating it with mercury and pressing the mass through a cloth to filter it. The resulting amalgam is heated, to remove the mercury. High in the Andes, La Rinconada has an alpine / tundra climate (ET, according to the Köppen climate classification), with no month having average temperatures even close to the 10°C threshold that would permit tree growth and a subtropical highland classification for the city. Far above the tree line, La Rinconada is unique in its high elevation and population, with the highest city of comparable population (Cerro de Pasco) being over 700 m (2,300 ft; 0.43 mi) closer to sea level. Owing to the extreme elevation of the town, climatic conditions more closely resemble that of the west coast of Greenland than somewhere only 14° from the equator. The town has rainy summers and dry winters with a large diurnal variation seeing cool to cold days and freezing night time temperatures throughout the year, with common snowfalls. The average annual temperature in La Rinconada is 1.2 °C (34.2 °F) and the average annual rainfall is 707 mm (27.8 in). Gorakshep, a base camp in Nepal at 5,164 m (16,942 ft; 3.209 mi), near Mount Everest. ^ Altitude of Human Survivability, Maximum (Vertical Limit). ^ West, John B. (July 6, 2004). "Highest Permanent Human Habitation". High Altitude Medicine & Biology. 3 (3): 401–407. doi:10.1089/15270290260512882. PMID 12631426. Retrieved 6 September 2015. ^ a b c William Finnegan (April 20, 2015). "Tears of the Sun The gold rush at the top of the world" (The New Yorker). Retrieved April 13, 2015. Many mining towns are company towns. La Rinconada is the opposite. Nearly all the mines and miners here are "informal", a term that critics consider a euphemism for illegal. Ilasaca prefers "artisanal." The mines are small, numerous, unregulated, and, as a rule, grossly unsafe. Most do not pay salaries, let alone benefits, but run on an ancient labor system called cachorreo. This system is usually described as thirty days of unpaid work followed by a single frantic day in which workers get to keep whatever gold they can haul out for themselves. ^ "Climate: La Rinconada, Puno". Retrieved 2 November 2014.